Hours: Open year round, daily during daylight hours. Admission: No admission fee, but there is a membership program run by the Foundation to support the Gardens. JGarden Description: Hidden in South Seattle, this 20 acre landscape blends Japanese garden concepts with native Northwest plants. Kubota was a horticultural pioneer who began combining Japanese design techniques with North American materials in his display garden in 1927. The resulting site is in a spectacular setting of hills and valleys, interlaced with streams, waterfalls, ponds, bridges, and rock outcroppings with a rich array of plant material. Kubota arrived in the U.S. from Shikoku in 1907. 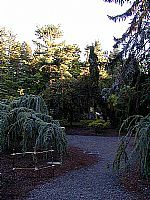 The Kubota Gardening Company was established in 1923 and went on to become a successful enterprise, with a garden on the Seattle University campus and the Japanese garden at the Bloedel Reserve as only two of the most famous examples. The garden started as a much smaller (5 acre) swampy site in the Rainier Beach neighborhood. It grew with the business to its current size. It was the family home, the business office, the nursery and a showcase for the company's techniques. A stream that naturally flowed through the site was enclosed in a pool and planted in the 1930's. The garden and home was abandoned in the 1940's when the Kubota family was forced to relocate to Camp Minidoka in Idaho, one of several Japanese internment camps during World War II. After the war, Kubota worked with his two sons, Tak and Tom to rebuild the business and expand the nursery. In the 1960's 400 tons of stone were added to the site, increasing the opportunities for new landscape features. Kubota Fujitaro passed way in 1973 at age 94, shortly after he had been awarded with the Fifth Class Order of the Sacred Treasure by the government of Japan for his contributions to Japanese gardening in the U.S. Later in the 1970's, the site Kubota had built became a target for condominium developers. Local community groups rallied to have the core 4.5 acre garden declared an historic landmark and succeeded in 1981, when the City of Seattle Landmarks Preservation Board protected it. The property was acquired by the City of Seattle in 1987 from the Kubota family. More recently, the City's Open Space Program also purchased the seventeen acres surrounding the garden to remain as a natural area. The garden is now maintained by the City of Seattle's Department of Parks and Recreation. The garden received a new entrance gate, designed by Gerard Tsutakawa, and wall in 2004. An entrance garden was designed by Kobayashi Koichi and constructed by attendees of the 4th International Symposium on Japanese Gardens in August 2004. The Kubota Garden Foundation was established as a membership-based 'friends' organization in 1989. The Foundation offers additional support to the garden in the form of additional funding, volunteer work, publications and public tours. To schedule a guided tour, call the Foundation at 206.725.5060. Volunteers gather to work on the garden every third Saturday from April to October, 8am - noon. Call the Kubota Garden Senior Gardener at 206.684.4584 to volunteer at other times. The Parks and Recreation Department permits weddings and other events to be held at the garden. Contact 206.233.7068 for scheduling and fees. Commercial photography and filming also require a permit. Call 206.684.4080. The garden can be reached using Metro Transit route 106. By car, take I-5 to the Martin Luther King, Jr exit to Ryan Way. Thurn left onto 51st Avenue South. Turn right on Renton Avenue South. Turn Right to 55th Avenue South. Shibata Yoshimi. "The Garden That Love Built." Reader's Digest, March 1989, pp 79-83.